Boeing produced 193 B-52G aircraft at Wichita, Kan. 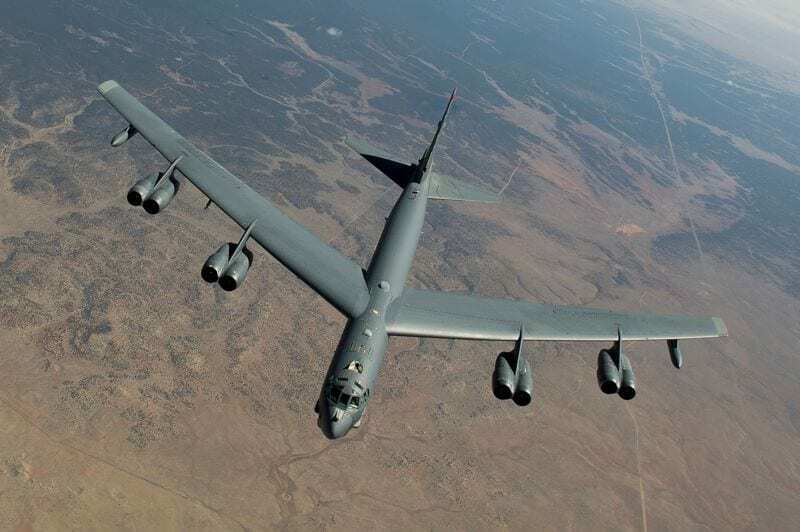 The B-52G introduced a shorter vertical tail and numerous internal changes, including a new integral-tank wing with internal fuel capacity increased to 46,576 U.S. gallons and with external drop tanks reduced in volume to 700 U.S. gallons each. The weight of the aircraft was increased to 488,000 pounds. The B-52G was designed for the GAM-87A Sky Bolt, an air-launched ballistic missile that underwent extensive Anglo-American design and development work before being cancelled. Its bomb bay was also configured to carry four ADM-20A Quail decoy missiles. B-52Gs could carry two North American GAM-77 (AGM-28) Hound Dog inertial-guidance standoff weapons. 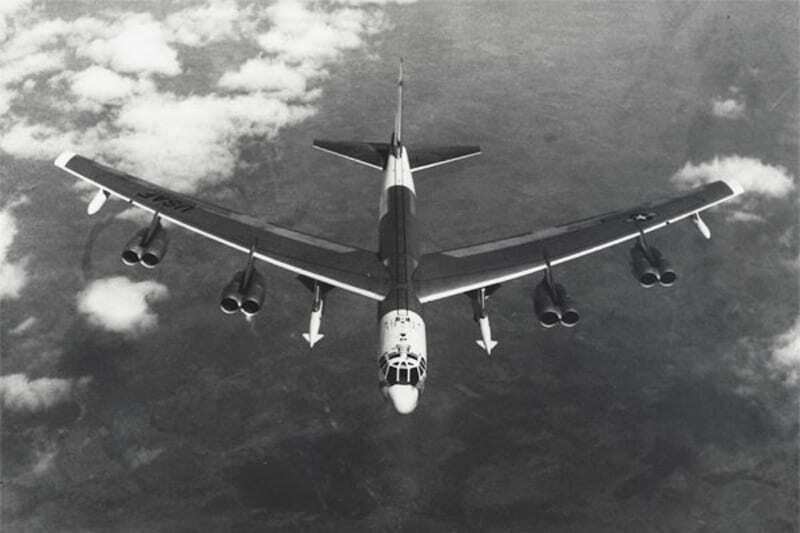 Later, the B-52G was modified to carry 20 AGM-69A short-range attack missiles. All of these weapons, together with the AGM-129 advanced cruise missile, have now been retired, but AGM-86 air-launched cruise missile remains on duty. The Stratofortress has carried various free-fall nuclear bombs including the current B61 and B83 bombs. Where earlier models had had a manned tail gun position, the B-52G had its gunner relocated in the main crew compartment and operating his guns via AN/ASG-15 fire control system. Armament of four .50-cal. (12.7-mm) machine guns in the tail was retained. The Air Force ordered 102 B-52H aircraft in 1960-61, taking first delivery on Sept. 30, 1960. With the short vertical fin of the B-52G, the H model was powered by eight 17,000-pound thrust Pratt & Whitney TF33-P-1 or -3 turbofan engines, developed from the familiar J57 but without the latter’s water-injection feature. Gross weight of the B-52H went up to 505,000 pounds for takeoff and a maximum of 566,000 pounds after in-flight refueling. Tail armament of the B-52H was remotely operated as in the G model but now comprised a single T-171 (later, M61A1) 20-mm Vulcan or “Gatling gun” cannon. The last B-52H was delivered to the USAF on Oct. 26, 1962, ending production of 744 Stratofortresses. The Cold War was serious business. Strategic Air Command (SAC) crews flew nuclear alert missions until 1969 and remained on nuclear alert on the ground until 1991. Several real-world accidents with nuclear weapons made headlines. Standards stayed high and the atmosphere on a SAC base was businesslike and largely humorless. So, too, was the movie Bombers B-52 (1957) with Natalie Wood and Karl Malden. A B-52 Stratofortress from the 2nd Bomb Wing, Barksdale Air Force Base, La., receives fuel from a Boeing KC-135 Stratotanker from the 151st Air Fueling Wing, Utah Air National Guard, March 26, 2012. It carries the distinction of being the longest-serving warplane in history. U.S. Air Force photo by Tech. Sgt. Dennis J. Henry Jr. But even the most hardened SAC veteran cracked a smile over the opening credits of Dr. Strangelove or: How I Learned to Stop Worrying and Love the Bomb (1964), the Stanley Kubrick film featuring Peter Sellers and George C. Scott. In the one minute 48-second opening sequence, a KC-135 Stratotanker struggles to insert its refueling boom into the vaginal fuel receptacle of a B-52 with an instrumental version of the song Try a Little Tenderness in the background. Vera Lynn sings the song at the end of the film. B-52s have been extensively modified over the years. Today, a B-52H flies with a crew of five – the pilot or aircraft commander, co-pilot, electronic warfare officer, navigator, and radar navigator (the bombardier). In an economy move, the aerial gunner crew position was eliminated on Oct. 1, 1991. The Stratofortress no longer carries a tail gun. That first flight in 1952 began a long saga. The flight itself was a remarkable success. At 2:00 p.m., Johnston and Townsend brought the YB-52 down as planned on the 10,000-foot runway at Larson AFB, a few miles from the Seattle takeoff point. The flight had lasted two hours and 51 minutes. At the time, it was the longest and most successful first flight in Boeing history. Keep an eye out for a series of photo galleries we’ll be posting to celebrate the anniversary of the venerable Buff. Thanks for your comment. We’d love to hear about some of your experiences and recollections of the B-52.